The ski lift takes you to the tropics while still enjoying a warming drink. As opposed to the mints and dark flavors that are usually paired with hot chocolate, this recipe goes fruity tropical with a blend of peach and coconut. It's an absolutely different take on hot cocoa and utterly delicious! For the ski lift recipe, you will need peach schnapps and coconut rum. Both liquors are staples in most bars and easy to find at the liquor store. The two flavors are also natural companions with chocolate, which is why this unusual cocoa recipe works so well. Pour the peach schnapps and coconut rum into a pre-heated Irish coffee glass or mug. 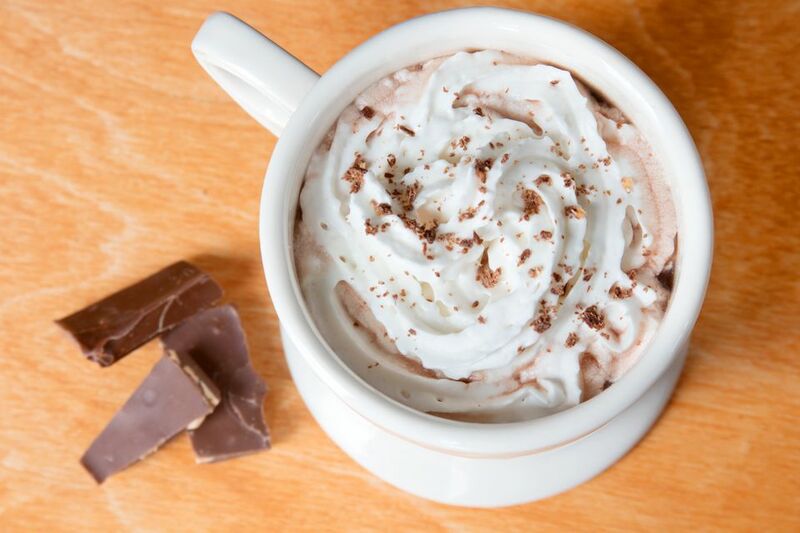 Fill the glass with hot chocolate. Top with whipped cream and sprinkle with coconut flakes. Warming your glass before making the drink will help it stay warm for a longer period of time. To do this, simply pour hot water into your glass or heat the water-filled glass in the microwave for about 10 seconds. Dump out the water before building the drink. Mix up your favorite version of hot chocolate for this recipe. Whether it's cocoa powder or melted chocolate, it will taste great as a ski lift. For the whipped cream, feel free to use a convenient canned version such as Reddi Wip. If you'd like the freshest whipped cream, make your own and store it for future indulgent drinks. As with any hot chocolate recipe, add all the yummy garnishes you like. Miniature chocolate chips, shaved chocolate, a drizzle of chocolate syrup, crushed nuts, and mini marshmallows are all fun additions. There are many coconut rum options available. While Malibu may be the best-known, you might want to try the coconut rums from Bacardi, Cruzan, Parrot Bay, or any other brand you spot at the liquor store. Keep in mind that these are typically liqueurs because of added sweeteners, so they'll also be bottled at just 35 percent ABV (70 proof). If you prefer to skip the peach, mix up a mounds bar instead. That recipe simply pairs coconut rum with hot chocolate and it is just as delicious. The ski lift is an ideal candidate for a frozen hot chocolate recipe. The peach and coconut flavors are a nice addition to that blended chocolatey drink, especially if you get a cocoa craving in the middle of summer! The flavors of the ski lift are nice with an accent of coffee as well. You can either pour a small shot of coffee liqueur or espresso vodka into the mix or make instant hot cocoa coffee. How Strong Is the Ski Lift? Most hot chocolate cocktails are pretty light on the alcohol and the ski lift follows suit. Unless you pour a high-proof (typically around 90 proof) peach schnapps, it's a mild drink. On average, the ski lift will have an alcohol content around 6 percent ABV (12 proof). Coconut Rum in Hot Chocolate? Yes, Please!